Thank you for visiting Keenan Hall. 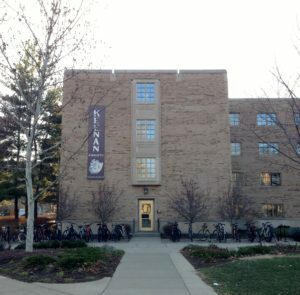 Keenan Hall is a 150-room male residence dormitory located in the North Quad of the University of Notre Dame, west of North Dining Hall. It is structurally connected to Stanford Hall with which Keenan shares the largest chapel on campus. We are well-known here at Notre Dame. To some, we are the Knights of Keenan Hall. To others, we are hooligans. But one thing is certain. We are Keenan Hall. We are Fratres in Christo (Brothers in Christ). We are resourceful, successful men. We are a force to be reckoned with. Even though Stanford seems to weigh us down by trying to ride on our gravy train, and even though Zahm is always trying to distract everyone else from our awesomeness with its many interesting antics, we do have the awards to show for our claims. Time and time again in recent memory, Keenan has often been recognized as Men’s Hall of the Year (’00-’01, ’03-’04, ’05-’06, ’10-’11) and Hall of the Year (’01-’02, and ’13-’14). Keenan falls short of perfection only because of the administration’s desire to be “fair” with their “award-sharing” system that reminds one a bit of the ideology of Karl Marx– each works according to his ability, each gains according to his need. Oh well. Long as we’re straight on who’s hot and who’s not, it does not matter. Perhaps the biggest factor in our success is our wide variety of cool traditions. These range from the ever-popular Keenan Revue, to our Reindeer Roast cookout, to our community service activities like our weekly volunteering at the Dismas House, our organizing the Great Pumpkin, tutoring students at the Robinson Center, or helping with Christmas in April. 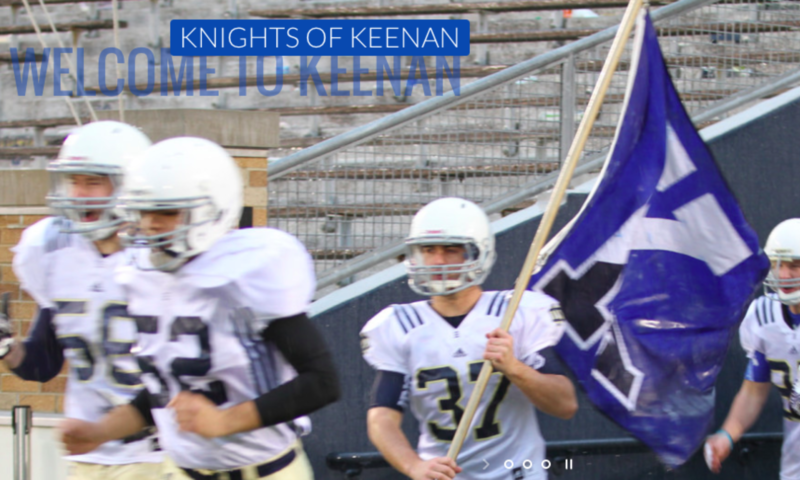 Athletic traditions are also strong in Keenan, from Interhall football to volleyball (especially Muddy Sunday) to horseshoes, Keenan teams make success their past and present. Section sports are also very important for the Knights, and there continues to be the building of tremendous legacies with “The Hambone Trophy” (given to the winning section football squad) and Waffleball, to name a few. Inside our walls, one can easily find more reasons for Keenan’s utter awesomeness. Our basement, the Keenan Kommons, is one basement to rule them all. We have a GIGANTIC projection screen movie room (now with cable! ), a big-screen TV/game room, a weight room, music rehearsal space, a study lounge or two, and of course our very popular student-run gourmet restaurant, Zaland (home of the “Best Pizza In Za-Land”). Our basement alone provides a number of handy services to the permanently overworked men of Keenan when they need a break, but our proximity to LaFortune and North Dining Hall are not to be ignored, as they come in handy quite often. But even with all of this, what allows Keenan to continually set a driving pace in the competition to be the best place to live on campus is the people within. We have a collection of some of the finest progressive minds you’ll ever see, and we are always pushing forward and striving to achieve (hardly ever without success). We even control a huge part of Student Government, boasting both the Senior and Junior class presidents, Martin Walsh ’15 and Zach Waterson ’16. With the desire to achieve greatness and the manpower to do so, Keenan will definitely compete once again for the Hall of the Year award. And unless the insanity of Zahm Hall begins to wear on us to the breaking point, you can look for Keenan in the headlines for years to come. We are the Knights. We are Keenan Hall!